Operating frequency 1.5 - 25.5 kHz. 5, 15 kHz. I have owned the Excalibur 800 blue version just prior to the newest Excalibur II and now own the Excalibur II 1000. The Excalibur II 1000 is one awesome beach machine. I really like the coverage of the 10 inch coil and the new electronics in the II's. The newest version seems to be more stable than the older versions. I also like the design of the new coil as the new 10 inch coil is as easy or easier to pull through the water as the old 8 inch. It is lighter for sure and also is slimmer which aids in the movement through the water. Pin pointing is a snap with the Excalibur II. It does take practice but the pin pointing will come to be natural after a very short while. I like to run in all metal all the time and use the discrimination mode to check to see if the target is iron or something of value. All metal mode does seem to be deeper in most instances. I would highly recommend getting a straight shaft for the Excalibur as the ergonomics of the Excalibur's factory shaft is really uncomfortable. The older versions of the Excalibur had the older headphones which were uncomfortable and not really all that good. The new Koss yellow headphones are a marked improvement over the older blue headphones. Not having to change the headphones to after market headphones will save you around $175. I would also recommend getting an extra battery pod for the Excalibur as you will be spending lots of time on the beach with this machine. Don't sell the Excalibur II 1000 short for land detecting. 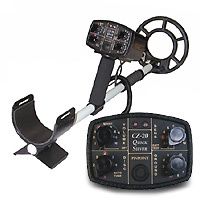 I use mine for land detecting and it is as deep as the Sovereign which is the land only version of the Excalibur which is to say that it is very very deep. 17 frequencies running all at the same time allows for most targets to be detected even in some pretty bad conditions like black sand. Don't forget that you will need a good sturdy sand scoop if you are using the Excalibur on the beaches. Hit those beaches at low tide and watch what you will find. Amazing! 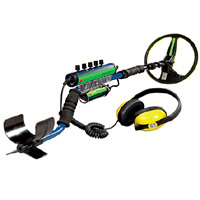 If you are looking for a great amphibious detector then the Excalibur II 1000 is a very good choice. I purchased a brand new cz21 in April. It arrived broke. Sent it back and instead of sending me a new they said they only fix it. Got it back after more than a month used it very little and it went completely dead. Now its back and fisher is giving a big run around. I paid $1200.00 for this nightmare and warn anyone out there not to buy a fisher. They are of poor quality and over priced not to mention of the poor customer service.